Nevertheless, the potential benefits of the small form factor were apparent, despite technology that wasn't quite there. Small form factor systems take up very little space, which is especially appealing in cramped conditions, like cubicles, dorm rooms, and when you want more room on your desk for a bigger monitor. They're easy to transport because you can fit it under one arm and they don't weigh much. There's also an aesthetic appeal to minimalists like me who like the efficiency of having no more computer than necessary to accomplish computing purposes. Early last year I wrote a guide featuring nettops, small form factor computers that were useful for the most basic computing tasks. These computers are now all but dead, having been replaced by the explosion of tablets. 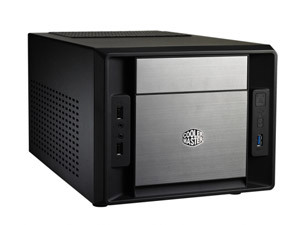 However, more powerful small form factor systems remain a viable option for a desktop computing solution. Intel's current Ivy Bridge-based CPUs have very low TDPs—even some quad-core SKUs have TDPs of 55W or less under full, sustained load. And AMD's current Trinity APUs pack a quad-core CPU and discrete-level GPU into a 100W thermal envelope. Both Intel and AMD solutions will typically produce far less heat than that, too, considering most people do not put their computers under 100% load for extended periods of time, and these chips idle at low power consumption levels. Furthermore, any PSU worth its salt features 80% efficiency or better, and DDR3 memory pulls 1.5V or less. We've come a long way since 2006! In this guide we've outlined small form factor gaming desktops, a file server, and on the next page, a diminutive desktop that won't break the bank. Not sure how you couldn't include Silverstone SG-09 as a case. Yeah, I know, the style is hit or miss, but hard to argue vs all the capabilities and features of it. Requires a slot load optical drive... $70. Waiting for mine to arrive. Needs the special ODD cable ($9). For all intents and purposes, requires a Silverstone full modular power supply ($80 and up) plus the short cable set ($25). We're over $100 already, plus the $100 for the case. Half height tray loads are $30. These tiny ITX systems also have another use not really mentioned: as a full blown media center PC (often with CableCard tuners). It's a combo of features that's hard to nail right now in the market place... quiet, small, presentable in the middle of a living room, optical audio out, half height PCie bracket you dont have to bend to get to work, etc. Optical audio should pretty much be phased out now that HDMI is so prevalent (HDMI audio is vastly superior, and carried by all equipment for the past few years). And it'd be hard to recommend a capture card for such a build, since there are so many standards in different regions. I disagree: The stereo amplifier I bought two years ago features optical in, but no HDMI. Optical also means less conducitivity, so more resilience against interference. Optical cables are much thinner. I run one under a door, where it is all but invisible, an HDMI cable would be a huge eye-sore - and would not fit. HDMI audio may be somewhat superior, if you have sources that get you "HD" codecs, but those are only on BDs anyway, so no point for most of us, who can't be bothered with BDs due to the DRM breaking free players - and just use a stand alone device. Music, games and everything else wil mostly be fine with optical. While multichannel PCM is nice to have, you'll need support on both ends, to gain anything over DTS/DD encoded audio. Plus, you don't always want to logically bind display and audio together. HDMI IS copper cable, and the signal is just voltage on that cable - whether Analogue or Digital, neither are totally immune to interference. So there are limitations and are potential interference issues. If you want a very long distance (cabling through doorways is mentioned) - I believe the Low-Voltage Differential Signal standard it uses recommends max 15m? I'd have to check. At the same time the LVDS signalling is very robust, and should be fairly good at dealing with interference.